Molinari cues are the new generation of carom cues. This cue brand originated from the sleeve of Predator cues. Predator was the first to approach a cue scientifically. Only after a very long investigation of the right materials in a certain form and a lot of testing did the Predator cue emerge. This was the brand for the pool cues. After years, a new brand has emerged for the carom market. the brand Molinari. This brand can no longer be ignored in the carom world. At the moment, the brand Molinari is better known and better than all its competitors. Who would not want to play with a Molinari cue now. What makes the Molinari cue unique in its kind. That first of all the top end or shaft. This top end is built up in 10 tipping points. From exelent quality Maple. This material has been dried and processed in a natural way for 2 years. In addition, the bottom end of course consists of 4 or 30 cake points. This depends on which model. See below the differences of the Molinari bottom ends. Molinari cues makes the difference. A stiff bottom and top end. The Molinari cue does what you want and does not deviate. 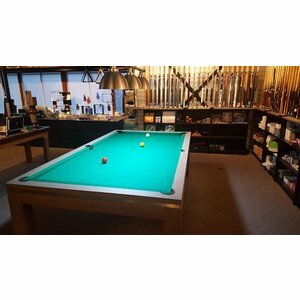 Come and try the cues in our store. The P3 ™ cue is the ultimate carom tool for performance and feeling. 30 pieces in combination with a reinforced top end construction result in an extremely solid cue. Your shot input yields 100% output, which is why Torbjörn Blomdahl prefers the Molinari ™ CRMBL30 series. P3 model has a core of a total of 30 wedge shaped pieces of wood. A hard maple 10-piece inner core integrated into a Compact Maple 10-piece interior, finished with a 10-piece Curly Maple outer layer for maximum stiffness, perfect feedback and great playability. The Uni-Loc Titanium Quick-release joint is embedded in a Phenolic structure for improved durability and durability. The stronger the joint assembly, the more right your recordings. Each P3 ™ is equipped with an insert at the rear, where it provides a good fit for the Uni-Loc ™ weight bolts. This allows the cue to be fine-tuned in 2.84 gram increments. C4 ™ technology minimizes the imperfections of exotic woods and inlays. The signals produced with this technology are the most solid inlay materials currently on the market. Four accurately produced Hard Maple wedges (pie tips) are fused into a core of exotic wood and where possible reinforced with Phenolic. The absence of the traditional bolt to join the forearm and the handle results in a more stable and solid unit than a traditional cue. The insert at the back of the cue, here reinforced with carbon, makes it possible to perfect your cue with the Uni-Loc ™ weight cartridges within 2.84 grams.